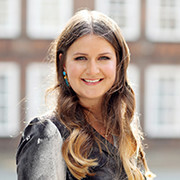 You’ve settled into pregnancy well, got your head around all the major body changes that are going on and can confidently say you’re well into the swing of things. 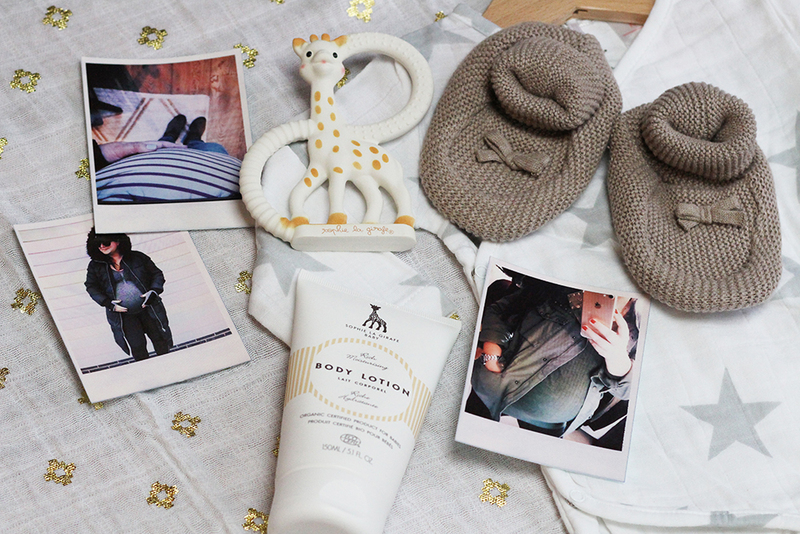 But there’s one major stumbling block – your maternity wardrobe. I hear you, ladies! Now in my third trimester, I can say I’ve finally got my pregnancy style down to a fine art. At least I’ll be prepared for next time! As a fashion journalist with years of outfit building behind me, I wrongly assumed bump-styling would be as easy as pie. It isn’t! 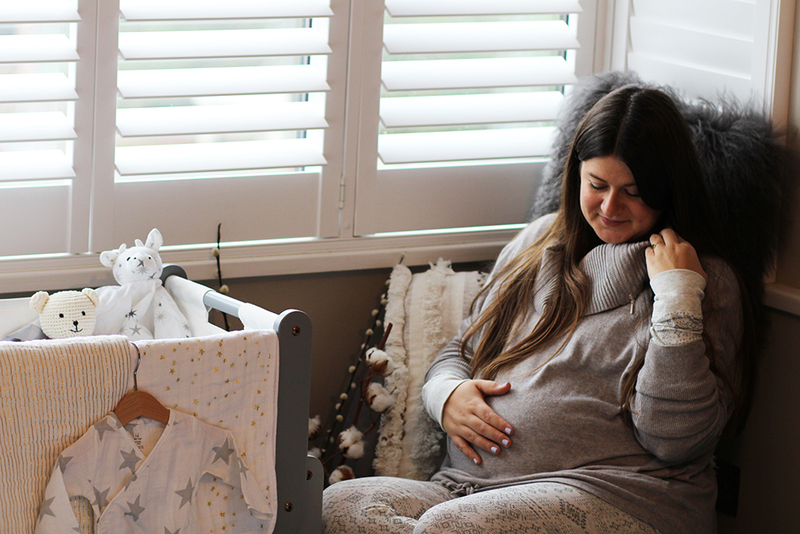 With my first baby just around the corner, I’ve teamed up with Alex and Alexa to show you how to successfully manoeuvre a pregnancy wardrobe without losing your sense of style… and mind! Read the full post over on their Life and Style blog. 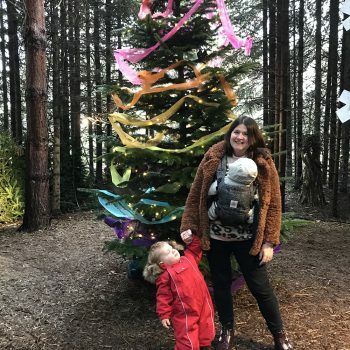 Expect a little trial and error, lots of perseverance, and topped up with my insider know-how and tips, I wish you a smooth few months curating a mama-to-be closet crammed with practicality and punch. Finding a go-to uniform is a saving grace when you’re pregnant. The last thing you’ll feel like doing in the morning is a full blown wardrobe try on session when battling crack-of-dawn hormones and groggy head. Building a kit of tried and trusted items will cut the hassle and form outfit foundations that can be twisted and tweaked throughout the nine months to come. I’ve spend hours trying on different kinds of maternity jeans throughout my pregnancy, and I’m afraid there really are no shortcuts when it comes to finding the perfect fit. Everyone’s body and bump shape are very different, there’s no magic formula. However, trying plenty of brands and styles will mean you can soon whittle down what works for you. The leading maternity brands, from Mothercare to Seraphine all have great options, but don’t overlook the high street maternity ranges either. I’ve snapped up pocket friendly pairs in Topshop and H&M too. The main thing to bear in mind is deciding whether you’re an under-bump or over-bump wearer. When I first put on under the bump denim I just couldn’t stand the pressure on my lower tummy, it made me feel physically sick. I also love the secure and warm feeling you get from over bump styles which have a snug built-in bump band. Always go for something with added stretch, comfort is paramount and there’s nothing worse than feeling restricted when you’re carrying extra weight. When you track down your ultimate pair – hurrah – be sure to snap them up in blue and black denim. Maternity jeggings offer a nice jeans alternative, and if you need something smarter, a leather pair will really up the pregnancy wardrobe ante. When it comes to tops, zone in on long line styles whether it’s perfect-for-layering jersey, a hero jumper, cosy cardigan or loose, button up shirt. These needn’t be solely from maternity ranges, you can simply upsize in your favourite shops to accommodate bump. Forget what the labels say, just look at the fit! Just be sure they offer that extra bit of coverage around the waistline. 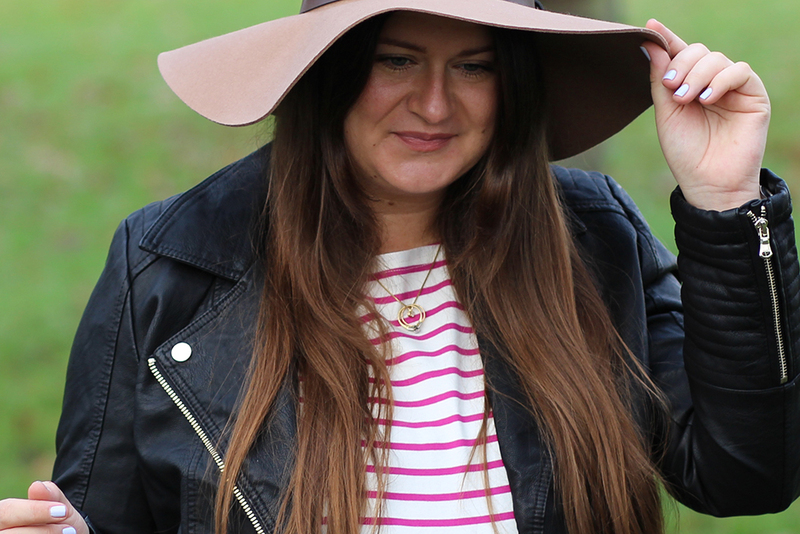 I’ve lived in breton, shunning the age old ‘horizontal stripes widen’ rule and embracing my exaggerated bump. Bump bands are great for making shorter tops maternity-proof. A band of fabric that stretches and fits neatly over bump, look out for multi packs with black, blue, grey and white options that can be rotated depending on the colours you’re wearing. Embarrassing bump-spillages are no more. A versatile coat or jacket in a maternity fit is priceless. I soon realised I couldn’t really squeeze into my regular fitted styles comfortably, and as it’s been winter, I invested in a long line padded maternity puffa to keep baby warm when needed. For something dressier, I snapped up a leather jacket two sizes up from my norm, to offer a bit more room around the sides. When it’s chilly, I add a chunky scarf to ensure my middle’s toasty. It’ll also be great in the summer to toughen up floral dresses. 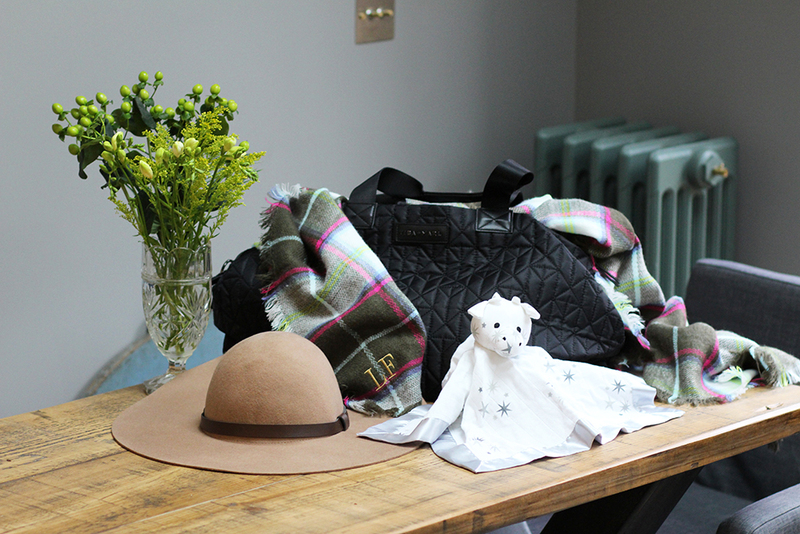 A bit of a mum-to-be indulgence is snapping up your changing bag early on to enjoy using it ahead of bubbas arrival. There’s so many great, stylish designs on offer these days, from backpacks to leather totes and bowling bag shapes like Tiba and Marl’s Raf design. The black quilting is timeless and it even has a smaller cross body bag inside too, so I’ll often leave it in the car boot with all my shopping and just take the essentials out with me. Pregnancy Style Tip: Don’t forget to keep an eye on your wedding rings or any precious jewellery. Hands can swell a lot during pregnancy, don’t leave yours on too late like I did – my hubby and I had a nightmare removing them at around six months gone. Panic stations all round! I’ve been wearing them on a necklace ever since and picked up a larger, costume wedding band to see me though. Probably the one time in your life where you’ll feel ridiculously good flaunting your curves. The bumpier the better! Pregnancy is the perfect excuse to welcome a shapely silhouette, plus, in bodycon there’s no mistaking that you’re pregnant and haven’t just overindulged at lunch! I’ve found wearing tight fitting midi dresses an absolutely staple. I love the bohemian look of smocks and looser fits usually, but with my new body, they just make me look like I’m wearing a tent. Not flattering at all. Switching to the opposite end of the spectrum with bodycon has worked better for me, allowing me to feel on trend yet blooming. This Isabella Oliver black midi has been an absolute staple buy. Go on, embrace the bodycon! Pregnancy Style Tip: Mix and match your add-ons and accessories to create a medley of looks – a cool bomber jacket and trainers for town, heeled boots and a smart bag for meetings and evenings or throw a knit and car coat over for something warm and chic. One thing I can guarantee is that you’ll spend way more time in casual loungewear and PJ’s during pregnancy than ever before! Particularly towards the end when evenings out become a rarity and the last thing of your mind at the weekend is schlepping around shopping centres. 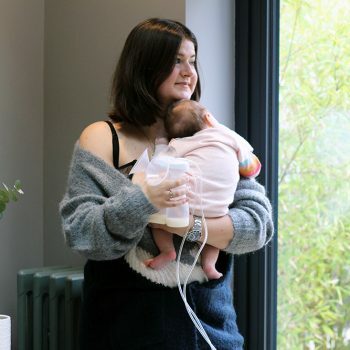 The key here is to snap up things you can make use of once baby is born, whether that’s in hospital, during all that snuggly sofa time at home in the first few weeks or welcoming cooing visitors into the house. A new pair of pyjamas or comfies will make you feel a million dollars. Go for light fabrics that can be layered up. 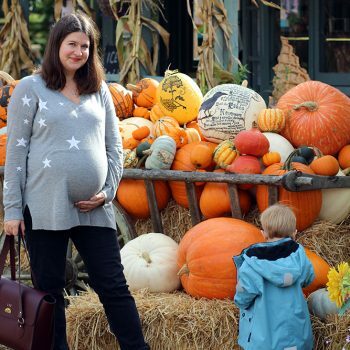 A roomy maternity jumper with nifty zips for breast feeding access later on is a winner and I swear by over-bump maternity leggings. 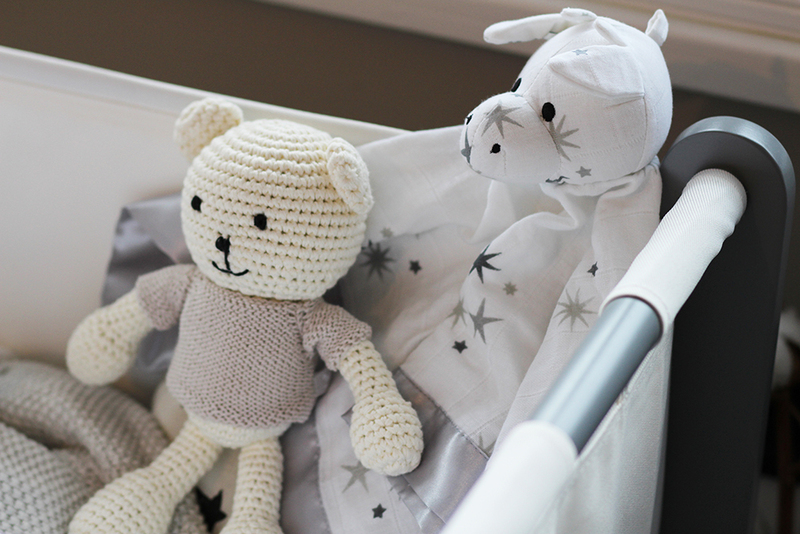 I’ve also been keeping a few newborn essentials in our bedroom and even in our bed to gain mine and my husband’s scents, which can be really comforting for baby in those first few days. This cute cow Musy Mate, gold metallic dream blanket, plus a super soft lamb and dinosaur have become regular additions into our bed of late! Pregnancy Style Tip: I had no idea my feet would go up a whole shoe size during pregnancy. Don’t panic, it doesn’t happen to everyone but it is really common and if it does happen to you, grab a pair of trainers, boots and slippers in a larger size the moment you feel you need to. Any excuse for new shoes, hey? If you’re having a summer pregnancy, you’ll probably be able to live in flip flops, lucky you. For more from my maternity journey, check out Pregnancy Survival: What To Expect. 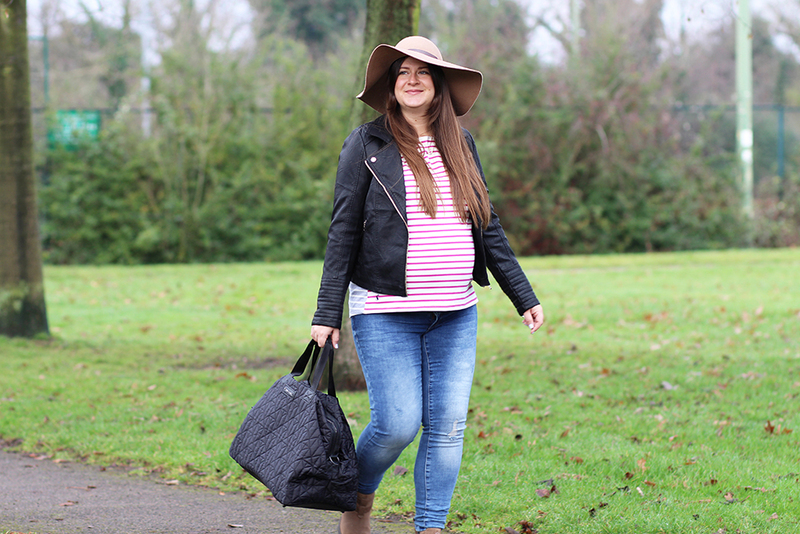 I’ve been really struggling with my pregnancy style – nothing seems to fit in the right way and there isn’t many maternity options in the shops! I love your outfit with the red stripes, simple and classic looking! Being my first baby and being petite it’s taken until 28 weeks for a little bump to properly form itself – I feel like I have been in the awkward pregnancy phase for ages! Thank you for some inspiration Lucy!